The RacingAwareness.com Charity Golf Outing Powered by Consumers Credit Union is just around the corner! RacingAwareness.com is looking forward to seeing all of the golfers, new and returning, while raising funds and awareness for The Neuroblastoma and Medulloblastoma Translational Research Consortium (NMTRC) at Helen DeVos Children’s Hospital. NMTRC Chair, Dr. Giselle Sholler, MD MSC, will be on hand to share information on the groundbreaking work being done by the NMTRC at HDVCH and how the event’s proceeds will advance the consortium’s efforts. We are also excited to have participating in the event, NASCAR Hall of Fame Driver, Rusty Wallace, who will be golfing and will address golfers during dinner. Social timing and dinner immediately following golf with silent and live auction. This year’s auctions will again feature one of a kind items! 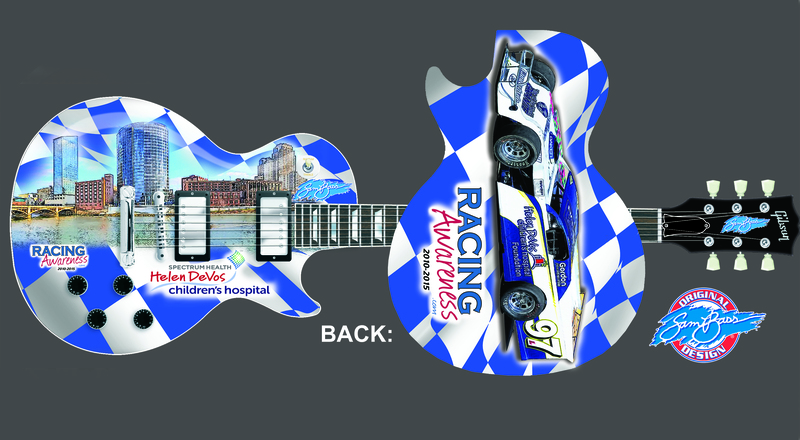 Highlighted items include a custom painted Gibson guitar by the Official Artist of NASCAR, Sam Bass, Ford autographed helmet with 4 tickets to the 2016 June NASCAR event at Michigan International Speedway, autographed Jack Nicklaus putter, corporate BBQ lunch prepared at your location for your employees, and a custom autographed Rusty Wallace ‘Last Call’ framed print. Additional items include, sporting event tickets, airfare and Disney vouchers, chef prepared in home dinner with live music, NASCAR Pit Road Experience, cooking school and personal trainer sessions. Something for everyone!